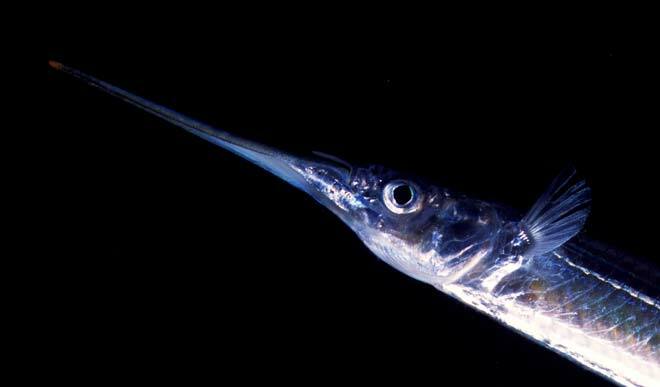 Known also as garfish, and as ihe by Māori, the piper (Hyporhamphus ihi) is endemic to New Zealand. It belongs to the family Hemiramphidae, also known as halfbeaks. They school in harbours and bays and are often seen when they skip along the surface or briefly glide. Omnivorous, pipers feed on eelgrass, seaweed and small crustaceans. They grow to around 40 centimetres. The very sensitive lateral line in their long lower jaws (visible here as a silvery grey line) helps them detect vibrations caused by their prey. They are good eating, although they contain many small bones.